Burn Off Ovens - Industrial Cleaning Furnace & Oven | Pollution Control Products Co.
At Pollution Control Products Co., you can select the precise burn-off oven and industrial furnace model to best handle your cleaning and stripping needs. Our burn off ovens are capable of handling a wide range of cleaning applications such as fractional horse-power stators, power station transformers, paint hooks and hangers, car skids and grates, engine blocks, water pumps, breaker plates, extruder screws and much more. 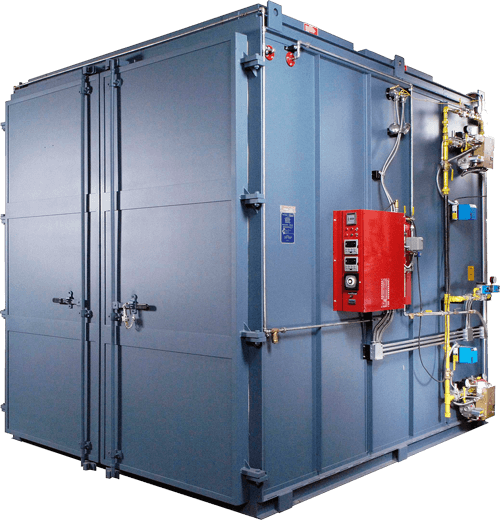 Patented Controlled Pyrolysis® Water Spray System controls the rate of smoke emissions preventing damage due to ignition or over-heating in the furnace. The Primary Burner heats the cleaning chamber to 800°F (427°c). Volatile materials are driven off as smoke. The burner flame is confined to the combustion chamber never touching the parts. The Afterburner operating at 1400°F (760°C) for half second burns the smoke, consuming the pollutants, leaving only invisible, odorless and harmless water vapor and carbon dioxide to exit the exhaust stack. Explosion Relief Door(s) automatically opens to relieve excess pressure then closes preventing air from reaching combustible materials. Fully Automated Controls include Diagnostic Panel indicator lights reflect the operational status of the oven and its controls. Indicator light failure pin-points the problem. 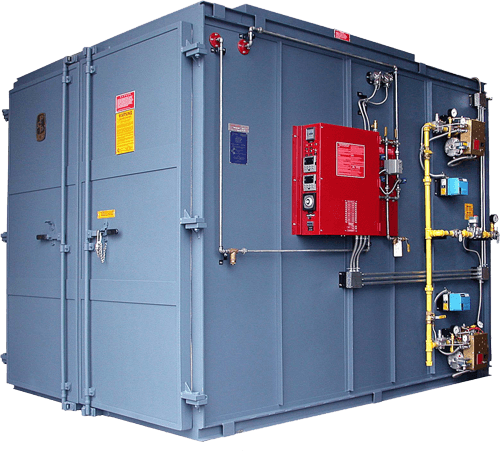 PCPC Burn Off Ovens are pollution-free, eliminating the use of acids, solvents and other hazardous cleaning materials. During the Controlled Pyrolysis® process, smoke, driven off during cleaning, is consumed in a powerful afterburner leaving only invisible, odorless and harmless carbon dioxide and water vapor to exhaust into the atmosphere. PCPC Burn Off Ovens extend the life of tools and parts! Parts come out clean and ready for reuse or rework with a minimum of preparation. Cost savings will usually pay for the furnace in a short time and continue to pay dividends year after year. 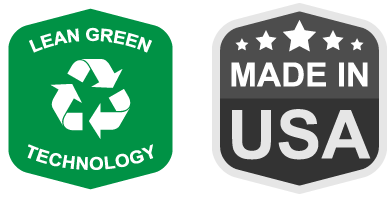 Proven in over 8,000 installations worldwide. PCPC Burn Off Ovens are fully automated and labor-saving! Our unique furnace design, advanced diagnostics and "push button" automated control system positively manage the charring of the materials and the rate of emission of smoke and other volatiles inside the furnace. Excess temperature is automatically controlled with water injection eliminating any danger of damage to parts. PCPC Burn Off Ovens are fuel-efficient, safe and built to last! Space-Age high-temperature soft ceramic fiber insulation and other fuel-efficient features allow the use of burners firing as little as 150,000 BTU per hour to quickly heat the parts and burn the smoke. 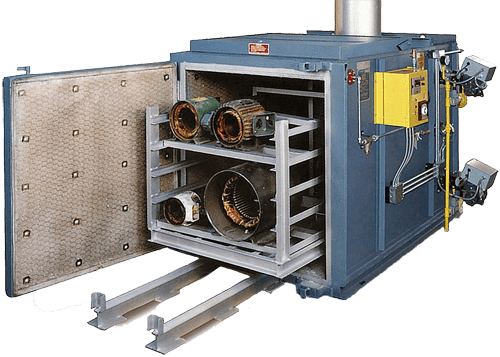 For parts with up to 2% combustibles, these ovens are designed to safely and economically remove small amounts of varnish, insulation, epoxy, paint, oil, grease, plastics, etc. For parts with up to 15% combustibles, these ovens have a highly sensitive control system for added protection and operational flexibility. For parts with up to 25% combustibles, these ovens have a more advanced system to detect overheating allowing you to strip greater loads of hard to process materials. 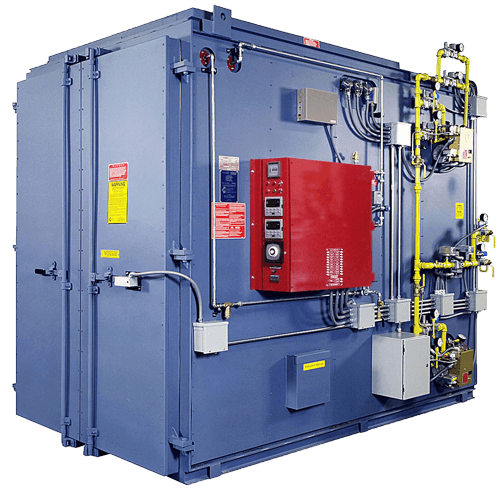 For parts with up to 50% combustibles, these ovens can handle any combustible that can legally be removed with heat, even space-age engineered plastics. Every Pollution Control standard model oven started out as a custom application designed to solve a specific problem.